Like a lot of children in Alberta, Bruce grew up on a family farm. Spending most of his time outside, Bruce grew to love the hands-on approach to life, the tradition of agriculture and the great outdoors. Getting his first taste of the construction business right out of high school, Bruce worked for a couple years before heading off to university. Working throughout the summers to support his studies, Bruce would graduate with a degree in history and anthropology. Continuing in the construction trade in the years following his degree, Bruce embarked on a new adventure – southern Japan. Landing in the southern prefecture of Fukuoka and ready to embark on a new adventure, Bruce would end up spending the next three years of his life teaching English and himself learning the customs and traditions of Japanese culture. 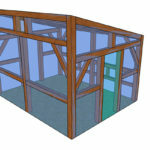 This is where Bruce first fell in love with timber framing. The hands-on craftsmanship of the timber frame grabbed the Alberta farm boy and wouldn’t let go. Returning to Alberta from Japan, Bruce would dive back into the construction trade working on many large projects in the Edmonton and surrounding areas over the next few years. Further developing his trade skill in the years following his Japanese adventure, Bruce would ultimately venture out on his own accord and bring that passion for timber framing to practice in the prairies. 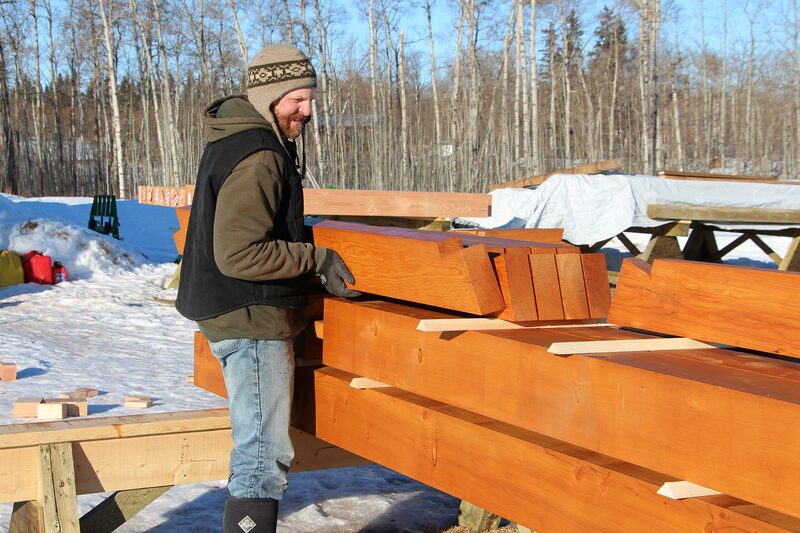 Formed in 2014, the McLeod Creek Timber Framing Company combines the heritage of both the Alberta countryside and hand-crafted timber frame structures using traditional methods of mortise and tenon joinery. Striving to craft structures that enhance the lives and lifestyles of their owners, Bruce and the McLeod Creek Timber Frame Company build structures with timeless beauty, ensuring that they are healthy, comfortable and durable, while being responsible to both the global and local communities by striving for outstanding energy efficiency and environmental stewardship. We love wood because it provides inspiration for the human soul. We love the way the wood smells when we walk into our shop. It connects us with the natural world while creating a sense of balance and calm. Wood has been used by artisans and builders for a millennia. By preserving traditional skills and passing them on, we can keep this crucial craft alive. In a modern world with a mind-boggling array of artificial products, wood is the real thing – you can see it, touch it, smell it…feel it. Wood connects us with the natural world around us. We love innovative design and providing wood solutions where others may not have the daring to venture. We take the authentic properties of wood and couple them with leading edge technologies in design and planning to deliver outstanding quality work that will last as your legacy. We believe in being ethical and honest, simple and open in all we do. People respect our skills and dedication to our chosen craft. We don’t make exaggerated claims, but we deliver high quality solutions and projects. We believe in no surprises with budget, quality or timescales and endeavour to reach the desired goals of your project. We believe that words like sustainable and healthy have honest meaning beyond marketing. If properly managed, wood is the ultimate healthy building material, for both your project and the global world that we belong to. We will always try to do the right thing: for the client, for the community and for the planet. We take whole-hearted steps to act in as environmentally sustainable a manner as we can, every day, every week, every project.